So that happened. One of the strangest events in recent box office history occurred last weekend, and still Hollywood insists on releasing new movies, as if we want to talk about them, and not the Great Box Office Quake of '15. Sigh. Let's oblige them, I guess. Leading the way of the trio of wide releases, at least in star power, is Mortdecai, an art-theft detective caper headlined by Johnny Depp, Gwyneth Paltrow, Paul Bettany, Ewan McGregor and Olivia Munn. 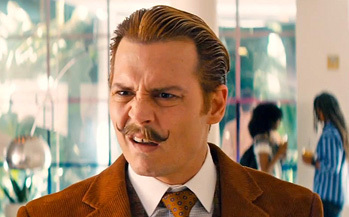 Depp is doing his level best Peter Sellers impression as a fey detective (with a ridiculous mustache) in search of a painting that may have a link to lost Nazi gold. Between the accent, the facial hair and the mincing, that's basically the entire joke of the film, and that's asking a lot from viewers. If your comedy circuits are wired in a particular way, this probably gives you a nice zap, but it's going to be firing at a mighty small segment of the population that's willing to put up with absurdist farce. Of course, Depp might bring along his own fans too, which is likely the reason this was made. In the past decade or so, he's run the gamut from mega-box office/critical acclaim (Pirates of the Caribbean), through mega box-office/terrible reviews (Alice in Wonderland), low-box office/critical acclaim (Finding Neverland) and on to just straight up flops (Transcendence, The Lone Ranger, Dark Shadows). Worryingly, it's been increasingly more frequent to find that last category of films in his repertoire, as the creative freedom he's earned from the Pirates films has led to awful creative decisions. Hence Pirates 5, I suppose.